Aged like a fine wine, true gourmet balsamic vinegar adds layered flavor to dishes. Fine vintage balsamic vinegar is a must for the gourmet kitchen. Unlike its humble white and red cousins, this vinegar has a royal pedigree. The earliest mention of balsamic comes from the 11th century, when a gift of fine aged balsamic was given to a Franconian emperor. During the middle ages, balsamic was used as medicine. Physicians and herbalists made drinks of it to soothe sore throats. Throughout the centuries, balsamic has been treasured like a fine wine. True balsamic vinegar is made only in Modena, Italy. Very sweet white grapes are cooked in copper kettles until they boil. The sweet grapes are boiled down into a thick syrup. The syrup is then poured in oaken barrels. A little of the old vinegar is added as a sort of starter to the batch. What gives balsamic its rich flavor is the next step in the process. Each year, the vinegar is transferred into different wooden barrels: oak, acacia, juniper, cherry, ash, chestnut and mulberry. The batch of vinegar picks up the unique flavors of the wood. Balsamic is aged at least three years, but preferably more than 12. The most prized vinegars of all can be aged well over 100 years. The oldest available vinegars have been aged 150 years! You can find balsamic vinegar in dollar stores or gourmet stores. The difference is in the purity and the age of the vinegar. Cheaper balsamic vinegars often contain caramel coloring, brown sugar, or other additives to mimic the dark amber color of a true, well-aged balsamic. If you're allergic to sulfites, steer clear of the cheaper vinegars too, because many contain added sulfites and preservatives. The best balsamic vinegar is labeled with the Italian words aceto balsamico tradizionale. This ensures that the vinegar has been processed in the traditional method and hails from Modena, Italy. Read the ingredients to be sure that you're getting pure vinegar. 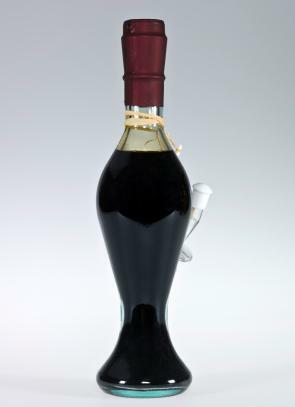 High quality balsamic vinegar can be stored and enjoyed almost indefinitely without loss of taste or quality. Be sure to store your vinegar in a cool, dark place. Once it's opened, some sediment may form at the bottom of the bottle. This is natural and doesn't affect the taste or quality, so keep enjoying your vinegar. Balsamic vinegar combines the sweet taste of the white grape with the complex, mellow flavors obtained through aging it in different wooden casks. Vinaigrette dressing: Made into a salad dressing, the complex flavors of balsamic really shine. Strawberries: Balsamic vinegar enhances the sweetness of strawberries. Use only the highest quality balsamic you can afford, and drip it on sparingly. The resulting tart-sweet taste brings out the fresh flavor of berries like nothing else. Peaches: Balsamic used on peaches has a similar effect as on strawberries. Slice up the peaches, drizzle on the balsamic, and enjoy. Balsamic is also used in gourmet sauces. One favorite is a balsamic-butter sauce that enlivens vegetable dishes. Simply soften half a stick of sweet, salt-free butter to room temperature. Using a fork, blend the butter with about one tablespoon of the best balsamic vinegar you can find. Add salt and pepper to taste. Some people add finely minced chives or shallots to the mixture. Once everything is blended, chill and use a pat on steamed vegetables such as asparagus, Brussels sprouts or carrots. A balsamic reduction may also be used as part of a recipe.